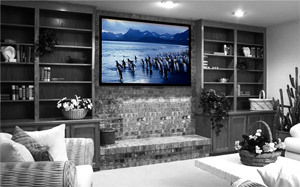 The Oxygon Frame is a fixed projection screen especially suitable for home theatre environments. The projection screen has a black steel velvet coated frame (80 mm wide and 32 mm deep). The velvet coated frame reduces surrounding reflections and provides a higher viewing experience. The Oxygon Frame is available in wide picture format (16:9) and the screen fabric is matte white with a gain of 1.0. Oxygon Frame is delivered in parts which is easily assembled, and the mounting gives opportunity for fine-tune installation onto the wall. Coated frames for reduction of reflections.